This is the same as some of our more expensive units just without optional upgrades fitted to get price down Early 60's valve preamplifier model with a very warm & vintage sound This is the same as some of our other units listed for sale but just without a few of the upgrades fitted. These have been described as the best Bass DI units available. Amazing sounding units when connected direct to guitars Perfect for guitar DI use, a very high quality mic pre and to add warmth and colour to all your recordings. All components v alues checked and parts swapped out where required with high quali ty components. Latest revision model with upgraded Mullard Mustard capacitors , high grade low noise resistors and high grade output transfor mer which give s a better frequency response and more headroom. 07/03/15 Hi Ian, After some extensive use, I'm really impressed with the Pre. Acoustic guitar recorded through a KM84 sounded incredible, no eq required. I have API 512c and Neve 1073 pres, yours is by far my preferred bass DI and may have even topped the API for elec guitars. "I just checked the Pre and I love iT I can't believe iT sounds little better than my V 76, s" Hi Ian I'm back in Australia. I now have my studio set up. Preamps include universal audio, focusrite, vintage rca's. But the first preamp I always go to. Sound qual ity is very similar to the V72 vintage units we have. This preamp brought life to my recordings like nothing else. Vintage Valve / Tube Mic Preamp - Amp - Mike Amplifier Module - 1950's. Brand new pro made 19 cases designed for these amps I can provide links to some tracks recorded using this model unit. It is the top unit in the main photo. Ready to use Pro quality high end studio unit complete with power supply built in. If you want a stereo pair i can sort that too EF86 mic input stage - 2 x EF86 - 1 x ECC83 - 1 x EL84 Built to a very high standa rd by the techs here at Analogu e Addicts UK - Over 3 0 years experience designing and building high end electronic and audio units. To keep this as original as possible only a few components have been replaced for reliability. Upgraded some capacitors and had a general clean and service. This has kept the magical sparkle valve sound which you just don't get with modern preamps and amps. Fully tested and working condition. Mic input - Transformer balanced rear XLR. Line/instrument level Input - Front 1/4 unbalanced. Hi z input - Front 1/4 unbalanced. Line output - Rear XLR unbalanced output - Upgrade option for transformer balanced output. Each unit is built and serviced to order. Please allow around 14 days to complete during busy periods. Some countries i europe do cost more than the quoted price. Few more tracks recorded with these and some of my other units. Compressor, Germanium Pre, 60s Pre. 60s Pre, Male vocal tracking. Compressor, Summing Mixer, Germanium Pre, Valve Pre. 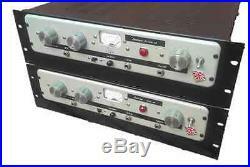 The item "Vintage Valve Mic PreamplifierI Preamp 1960s Tube V72 V76" is in sale since Wednesday, May 9, 2018. This item is in the category "Musical Instruments\Pro Audio Equipment\Preamps". The seller is "analogue-addicts-uk" and is located in Milton Keynes. This item can be shipped worldwide.